Another Day – Another Award! 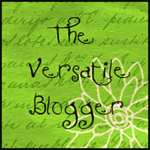 Last week a comment left on my home page informed me that I had been awarded “The Versatile Blogger” Award Badge – what an honor! This brought with it some more research into the world of blogging awards. First a great big Thank You to Megan from Make Something Mondays. I have been following Megan for a while and have found her posts to be full of humor, great ideas and indeed versatile! Make sure to check her out when you are surfing the net. Once Upon A Dream – My favorite artist blogger in Norway! Live to Write – Write to Live – Professional writers talk about the craft and business of writing. Insightful and informative – I look forward to each post! A Travel and Tea Diary – Yes, its a blog about the art of drinking tea while traveling! Check out the cities and rich history the author uncovers. Sketches & Jottings – A visual feast! Mazeinpuzzles – Full of intrigue and a must on your list of blogs to check out! Diannajessie – For quilters and sewers, a blog based in England filled with great projects and information. Art Profiles – A blog devoted to artists from around the world – any medium and great diversity. Photo Botos – Another of my favorite blogs featuring regular posts with captivating photography. Angela Shella – Insightful and thought provoking by a musical artist and philosopher in her own right. Savoring Every Bite – Just as it says in the name – all about food! Walking with a Smacked Pentax – Based in Yorkshire this blog is all about the area the artist lives in. A great resource! Elaine Quehl – An accomplished artist, teacher, lecturer and great writer, Elaine shares insights and generates discussion. Worth checking into! Margaret Blank – Another fiber artist, Marg is based in rural Alberta, Canada and has been blogging for 9 years. Abe Pacana Outdoor Photography – Great imagery and photographic tips for shooting outdoors! Manipal’s Photoblog – Information packed and amazing photography! 1. I acquired my first computer in December of 1999 – just before Y2K: Does anyone remember that panic? I had never sent an email till then… Once I set up my blue clam-shell iBook there was not turning back! 2. One of my passions is creating digital presentations in Keynote. Since discovering all the amazing features this Apple program offers I am constantly challenging myself to come up with new transitions and image sequences. 3. I love photography and take a camera wherever I go. On March 1st I started a photography blog featuring one image and inspirational quote each day. Check it out and leave a comment! 4. Nature serves as my constant source of inspiration. I am inspired by a sunrise, the sunset and anything in between! 5. When I don’t spend time in the studio I enjoy a good read on my iPad. My favorite writer is Geraldine Brooks, an Australian born writer and former middle east correspondent. I enjoy her biographical and historically based novel alike! 6. My favorite kitchen appliance is my KitchenAid mixer. I love to bake and entertain friends for dinner. I am constantly trying out new recipes. 7. Daily walks along the lake with my dog provide balance and time for reflection! 20 Mar	This entry was published on March 20, 2012 at 5:45 am. It’s filed under Art, Blog Awards, Creativity Update, Photography & Events and tagged amare vitam photo blog, Blog Award, blue clam shell iBook, first computer, personal reflection, Photography, Versatile Blogger Award. Bookmark the permalink. Follow any comments here with the RSS feed for this post. Keep up the good work, I read few content on this site and I think that your web site is really interesting and has sets of superb information. Congrats Anna.. “Talent develops in tranquillity, character in the full current of human life.” by Johann Wolfgang von Goethe. Great web site with very interesting content. Keep up good work! Great blog. Congratulation on your award and thank you for sharing with us things about you. Checked out the “art profiles” site above. Was that posted by Anna Hergert here? I really appreciated that and the other art things. Don’t get me wrong, but, as much as I like working on the writing my wife tells me I should do more art. Here is the thing that I think is great about the art websites: It’s like being able to go to a gallery at one’s fingertips. Seeing new art at a gallery is an inspiring thing. Yes you see some work that one doesn’t quite “get” or like. But, it is really good when you see something you appreciate. Too, the web writer’s sites are like that for me too. I tried to explain this a year or two ago. Going to bookstores and libraries was like that for me too. Finding and reading someone “new” to you or one’s self was exciting to me as well. And you sometimes read someone that does not appeal to your own senses. So what. It’s great being able to do that. This is the first time I’ve commented here in a while ….. well, a few days or weeks. That’s because I’ve been bogged down making a book trailer for my ebook. Yes. I’ve been shooting clips with my smart phone and editing on “quicktime player.” Fascinating. I completely agree that much time is spent keeping a blog current and interesting, not to mention diverse to keep the followers’ interest. Much like you (and your wife) I feel I need to spend more time creating art in the studio. With that being said: When I step back and reflect I realize that much of the writing and creating is connected. Recently I was engaged in a discussion with another artist who is a strong supporter of artists who embrace the internet – both as a tool to create as well as an effective marketing avenue. He sincerely believes that maintaining a strong internet presence in today’s art market is an obligation we as artists must meet on a continuous basis. Loved reading about your favorite blogs and will be sure to check some of them out in the near future! Thank you so much for including the “crew” from Live to Write – Write to Live on your list. That’s so kind of you. And thanks for sharing your other faves – there are many I will go check out! Jamie, the nomination is well deserved! I look forward to every post! Yes, your crew truly does deserve the descriptive “versatile”! Keep up the great posts! Hello Anna – Thank you so much for the Versatile nomination for http://sketchesandjottings.wordpress.com. I’m honored. I will follow up with a post about it as soon as I can and I just want you to know how much I appreciate it! You are welcome! Keep up your great posts! I’m so excited! My “Grand Prize”, Prairie Reflections, has arrived safely at it’s new home and i have a perfect spot to hang it in my new Studio. Thanks Anna. I shall cherish it forever! Judy, I am glad “Prairie Reflections” went to such a deserving home! Thanks for letting me know it arrived safe and sound! Congratulations again to you, the grand prize winner of the contest.